If you've been following along with this tutorial series, you've added Google Analytics to your Etsy account, taken a tour of Etsy Shop Stats, and set up campaign tags for your social media and advertising links. Nice job! You've laid the foundation for some serious data crunching! Today we're going to talk about using your Google Analytics and Shop Stats data together to get a clear picture of what is (and isn't) bringing customers to your Etsy shop, and what your customers do when they get there. Your pageview and visitor counts will be different in Shop Stats and Google Analytics. This is not a sign that anything's wrong; the two services measure visits in different ways. They also handle your visits to your own shop differently. Etsy's Shop Stats automatically filters out your logged-in visits to your shop. If you visit your shop when you're not logged in, Shop Stats will record your visit. Google Analytics will record all of your visits, logged in or not. You can filter yourself out by IP address if you have a static IP address, however if you have a dynamic IP address, IP filtering won't work. These discrepancies alone aren't the only reason to relax about pageviews. Pageviews are not quite as important to a shop as they are to a blog or website that relies on pageviews to sell advertising. What matters in your shop is not how many people visit, but how many buy. When you're developing your promotional strategies, you need to make sure you're focusing on bringing in shoppers, not just visitors. That's where analytics can help! Shop Stats gives you a personal, almost emotional, view of how your visitors interact with your shop. It literally shows you their "hearts"! Shop Stats tells you which of your items get favorited or added to treasuries, which can help you identify which of your products to promote more heavily. Patterns in favoriting or treasury-ing can also give you an idea of which of your photos are your best. Study your most popular products and compare them critically with your least popular — you may discover things you can change to boost the attractiveness of your more neglected products by comparing them with your most popular. Only Shop Stats can tell you exactly what has sold in your shop; Google Analytics can't access this information. This information alone is useful, since it can help you identify your best sales seasons and give you a general idea of what shop promotions increase sales. When it's used in concert with data from Google Analytics, though, it becomes priceless. You can match sales data with your Google Analytics traffic to determine with certainty which campaigns, links, and promotions brought in the most sales. Often, your customers won't buy on their first visit to a shop. In Google Analytics, you can find out how many of your visitors have been to your shop before, and if you're using campaign tags, you can find out which campaign sent them, even after their first visit. To view your repeat visitors, go to Audience > Behavior > New vs Returning. You'll see a summary of your total visits broken down into new visitors and returning visitors. 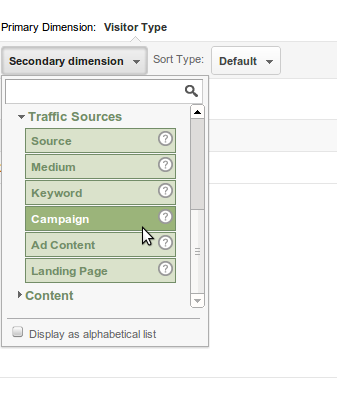 To see which of your visitors came in through one of your promotional campaigns, use the "Secondary Dimension" dropdown menu to select Traffic Sources > Campaign. The page will refresh with an updated breakdown, showing you new visitors, returning visitors that came from non-campaign sources, as well as new and returning visitors referred by your individual campaigns. This information is useful because it helps you measure the long-range value of social media links and advertising. It can be discouraging to tweet your heart out about your shop, then feel like you tweeted in vain when you don't get any sales that day. If you've campaign tagged your tweets, and match that info up with your Shop Stats, you may realize that a tweet from weeks ago caught the attention of a customer who came back today to buy! When you sell online, it's important to know where in the world your visitors come from. For this example, let's say you ship all over North America, but don't ship outside of the continent. Using Google Analytics and campaign tagging, you may discover that some of your campaigns are receiving a lot of attention in Europe. With this information, you might decide to expand your shipping area, which could be a great opportunity to increase sales! If it's not possible to add new delivery regions, this info can help you make changes to to your promotional campaign to ensure that you're reaching an audience within your shipping area. This might mean adjusting your tweeting schedule to better suit the right time zone. Or, you may realize that you need to advertise on different blogs if the blogs you advertise on now are skewing outside of your shipping area. Shop Stats lumps all of your non-product pages into a general category of "Your Shop". Google Analytics can show you how many of your visitors looked at your shop's feedback, your circles, your favorites, your shop policies, etc. This is good to know because you may discover that your shoppers are missing out on important information by skipping the shop policies page or your profile page. With this data, you can go from saying "It seems like nobody ever reads my policy page!" to "I know nobody ever reads my policy page, so I'm going to put this important info in my shop announcement/convo confirmations/product descriptions". This might help you head off customer service convos before they happen, and make it easier to close sales! 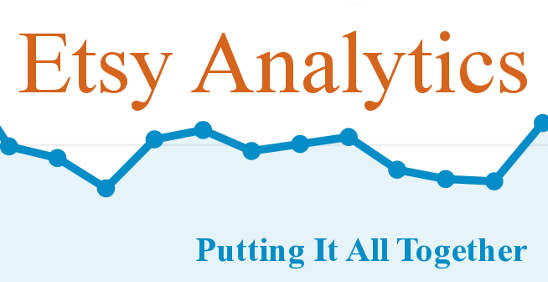 You've learned a lot about using the analytics tools available for your Etsy shop! Next, let me put a big long reading list in your hands to help you put the information you'll gather to good work.